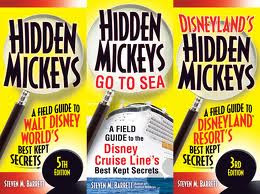 Picturing Disney: Hidden Mickeys 5th Edition: Grab one & head out hunting! Hidden Mickeys 5th Edition: Grab one & head out hunting! As you could probably guess from the Hidden Mickey Challenge and the rave reviews about the Hidden Mickeys app I am a huge Steve Barrett fangirl! The Hidden Mickeys guide has kept me busy sitting at home on my couch scouring my own picturing let along how much fun they are in the parks!! The newest edition of the Walt Disney World guide (and the prize for our winner last week) includes over 200 new Hidden Mickeys bringing the total to over 1,000!!!! Not only is this a huge catalog of Hidden Mickeys but it also gives you all the information you could possibly need to know to get started. You will find definitions, tips, and even the authors very favorite ones all listed neatly in a pocket guide. Whether you are going to be one of the people that I spot every trip carrying around their guide and searching as the tour the parks, or maybe just need some reading for your plane ride, you will surely see Disney World in a brand new light once you begin spotting this guys everywhere you look! Be sure to pick up the Cruise and Disneyland editions if that is where you are headed next as well as checking out the iTunes app. While you are waiting to pick up your copy stop by his website at www.HiddenMickeyGuide.com! And if you need a more general travel guide check out Steve's Hassle-Free World Disney World Vacation guide!